The seminar will take place, 7th June, 11 am, in the IECB amphitheatre, 2 rue Robert Escarpit Pessac. Jonathan Faherty, Fluidic Analytics, former Research Scientist in the Protein Sciences team at Cambridge Epigenetix. The characterisation of biomolecular interactions has many applications in the fields of health research and diagnostics, but few current techniques allow for studies to be performed in physiologically relevant conditions or in cases where sample volumes are limited. Here we discuss a powerful approach for probing the sizes of proteins and their complexes in solution - microfluidic diffusional sizing (MDS). Importantly, with MDS small volumes of protein are studied with high sensitivity in their native state without the use of a matrix or surface. The system is maintained at steady state laminar flow, which enables the diffusion of protein species as they pass through a microfluidic channel to be measured, and consequently their hydrodynamic radius (Rh) to be determined. Preliminary experiments show that this approach has potential applications ranging from basic biophysical analyses to in-solution characterisation of protein interactions and the formation of protein aggregates. Jonathan Faherty joined Fluidic Analytics as a Field Applications Specialist in 2017. Prior to Fluidic, Jonathan was a Research Scientist in the Protein Sciences team at Cambridge Epigenetix. As a bench scientist, Jonathan contributed to the development of Cambridge Epigenetix’s novel epigenetic diagnostic discovery platform based on the 5-hydroxymethylcytosine (5hmC) mark. He has a Ph.M in Biochemistry from the University of Dundee. Fluidic Analytics was founded in 2013 based on a new technology for protein characterisation that emerged from the laboratory of Professor Tuomas Knowles at the University of Cambridge. This proprietary technology allows proteins to be characterised in a rapid, accurate and cost-effective manner. Fluidic Analytics’ vision is that protein science will transform our understanding of how the biological world operates in real time, a transformation every bit as revolutionary as the one we’ve seen in DNA sequencing. Fluidic Analytics aim to make this vision a reality by developing products that enable easier, faster, more convenient and more accurate protein characterisation. Our first product – the Fluidity One – measures changes in protein size caused by folding, aggregation or interactions in solution in biologically relevant timescales, without the need for matrices or surfaces and without a bias towards large species. 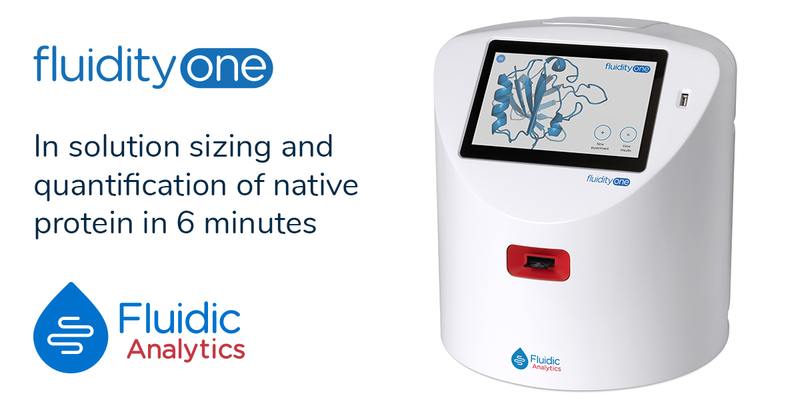 Measurement is fast and requires as little as 50 nanograms of protein making the Fluidity One perfect for rapid quantification and characterisation - from small peptides to large complexes and over a wide range of concentrations.